Jeff Sprang has had the good fortune to meet and paint the portraits of some of the leading figures of our time. In June 1990, Jeff Sprang attended a reception for Nelson Mandela at Central Technical School which led to the painting of the Portrait of Nelson Mandela. A limited edition print was produced and signed by Mandela in support of the education of Black South African students. In 1995, City TV was the venue for a watercolour exhibition of Sprang’s portraits titled Putting on Airs. Portraits of Avi Lewis and Natalie Pujo of City TV, Erica Ehm of MuchMusic, and Jeanne Beker of Fashion Television were featured in the show. 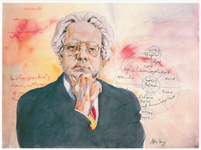 Northrop Frye (1912-1991) was one of the most important literary scholars of the twentieth century, and a distinguished professor at Victoria College, University of Toronto for over fifty years. Sprang was one of Frye’s former students and Sprang’s 2005 portrait of professor Frye at the blackboard in front of the lesson The Conspectus of Genres hangs in Northrop Frye Hall. In 2006, Sprang donated his portrait of Stephen Lewis to the Peel District School Board. A limited edition print of the portrait was produced and all proceeds from sales of the print go to the Stephen Lewis Foundation to help ease the pain of HIV/AIDS in Africa. Sprang’s work includes other notables such as Muhammad Ali, Sidney Crosby, Amanda Lang, sensei Masami Tsuruoka and Dr. Tom Chau. Art publications including Art Impressions and Azure magazine have reviewed Sprang’s painting. He has also been featured in the Toronto Star and on City TV, CBC, Pulse 24 and CBC Sunday Arts Entertainment.